There are currently 12 books in the series: 14×14, 15×15, 16×16, 18×18, 20×20, 21×21, 22×22, 24×24, 25×25, 28×28, 30×30 and 36×36. The larger puzzles work just as you’d expected, so in Sudoku 36×36, for example, you must place 0-9 and A-Z into every one of the 36 rows, 36 columns and 36 6×6 boxes! These puzzles are designed so they don’t need any advanced logic – just scan the rows and columns and boxes to see what’s missing and what can fit where. All of the puzzles are designed with attractive 8-way symmetry patterns. 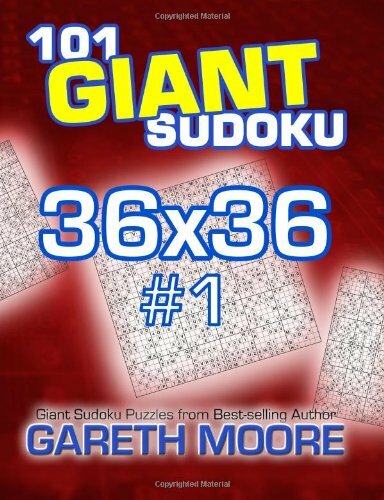 This entry was posted by Gareth Moore on July 29, 2013, and is filed under Published books, Sudoku. Follow any responses to this post through RSS 2.0. You can leave a response or trackback from your own site. Sudoku Xtra 20 is out now, available pre-printed from your local Amazon or as a PDF to download and print yourself.